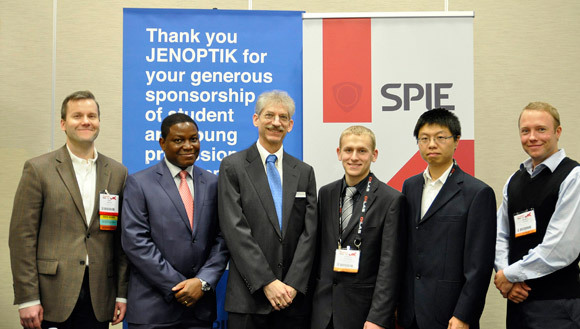 From left: Judges Michael Mielke (Radiance), Wellington Chadehumbe (Triumph Venture Capital) and Marc Himel (Jenoptik Optical Systems) with winners Samuel Schaefer (University of British Columbia Okanagan), Yin Wang (Princeton University) and Petrus Johannes Venter (University of Pretoria) at the OPTO Startup Challenge. Schaefer developed the microscope with Kenneth Chau, assistant professor electrical engineering, and fellow undergraduate Stephen Boehm during a Natural Sciences and Engineering Research Council of Canada (NSERC) Undergraduate Student Research Award (USRA) term over the summer of 2011. The OPTO Startup Challenge, an international competition to pitch photonics business ideas, was held Jan. 25 at Photonics West, one of the largest optics and photonics conferences in the world. Competitors included students and professors from universities from around the planet, and the prize was an all-expenses paid trip to attend a five-day course at the University of California at Davis Entrepreneurship Academy, courtesy of JENOPTIK, an optoelectronics group, to help further develop the business case. Schaefer got interested in photonics research when he joined Chau’s research group in the summer of 2010 with his first NSERC USRA grant. “Dr. Chau’s enthusiasm and help inspired me to become more interested in developing innovative solutions to many of the problems society is faced with,” says Schaefer. He has applied for NSERC funding for a master’s degree research project, and is currently working toward starting his own company in BC, based on some of the research he has been working on.